The turkey has been cooked and carved, everyone had too much food and the leftovers have been packed away. The big question now is what to do with them. Of course there’s the traditional turkey sandwich, but there’s so much more you can do with your Holiday leftovers. Since I spent a lot of time and money on cooking a turkey with all the fixings, I want to get as many meals as possible out of my leftovers. 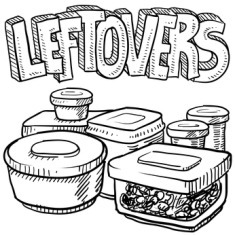 If you are looking for some tips and some new recipes to try, download the Holiday Leftover report below. I hope you and your family had a wonderful Thanksgiving and are ready to move into the rest of the Holiday Season.